Hi guys! Thanks for your constant compliments on my craft works. I got done with the winter session yesterday. 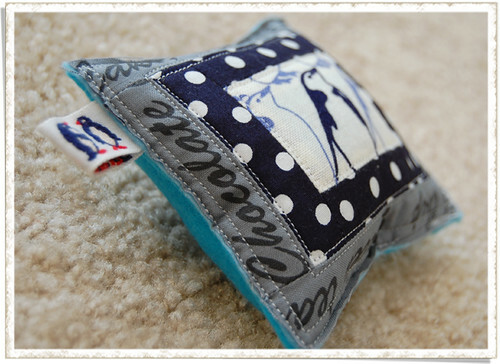 new, so I made five pincushions!! random, but I love the looks the randomness created. 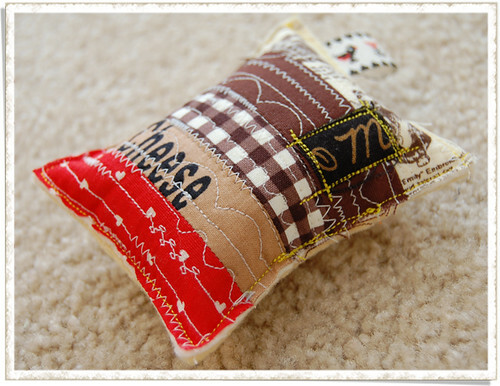 Initially, I was going to make pincushions using only scraps. collection... but only "some", mostly scraps! That's a good thing. 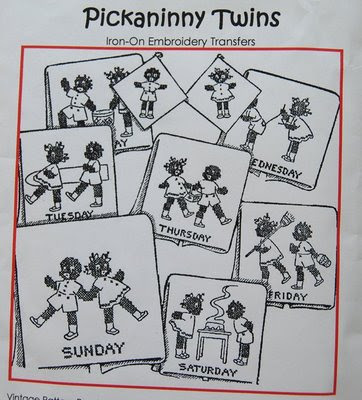 played a lot of roles in this pincushion project. For instance, these chickens!! So super duper cute!! to use them. 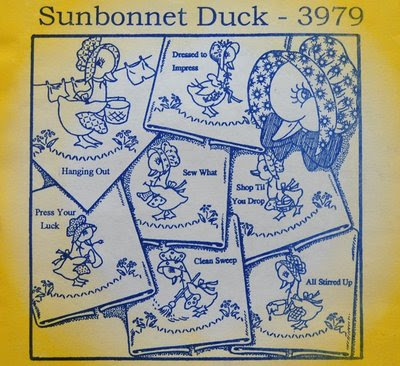 They really stand out with pincushions. but this bright pink one was the only pink thread spool I had. But I think it turned out kinda interesting. I kinda like the backing too - pale pink felt. The last one is this guy. Looks familiar? Yup! 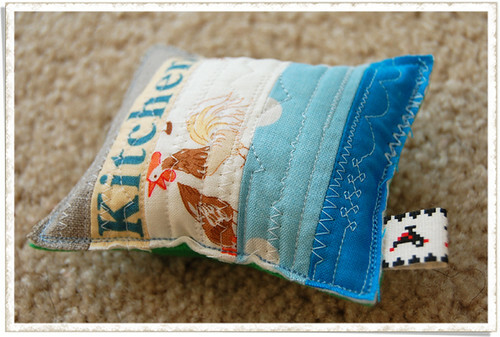 This is sort of a tiny version of the penguin quilt! that became part of the quilt got too much attention. for the pincushions? Do you know where it came from...? I printed it out !!!!!!!!!!! 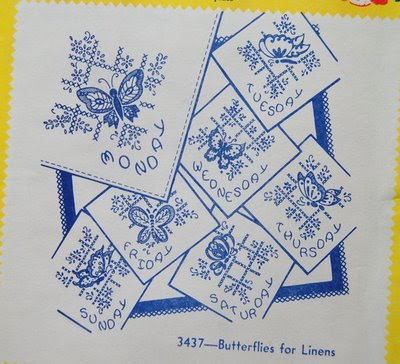 to print your own things on fabric at home. so I ran into Joann today and grabbed more solid fabric! 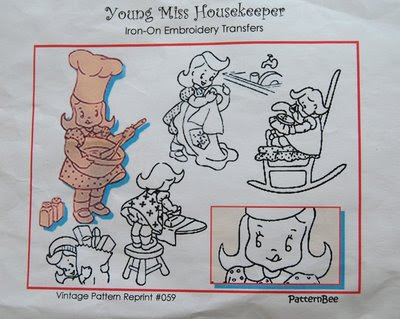 and got LOTS of vintage iron transfer embroidery patterns. I was way too excited about those and got way too many. lots of them that I have more than one. If you're interested in any of these, e-mail me. I love the pink thread! 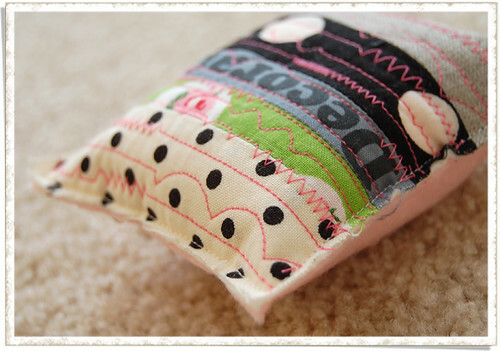 those pincushions are fabulous...love the random stitching! 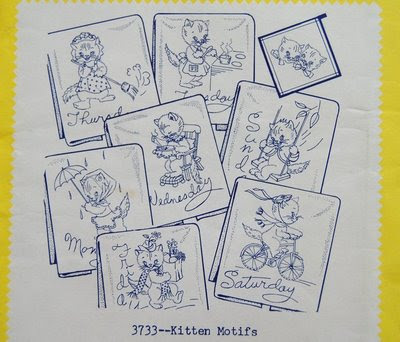 The vintage embroidery patterns are cute...you certainly did get a few!! 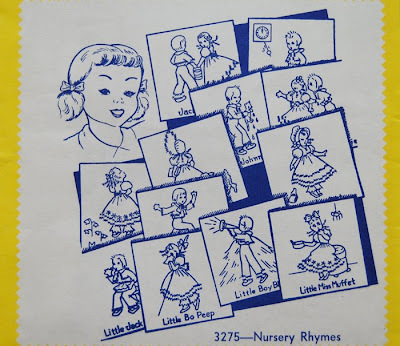 wow, you certainly did get a lot of patterns, but they look such fun. 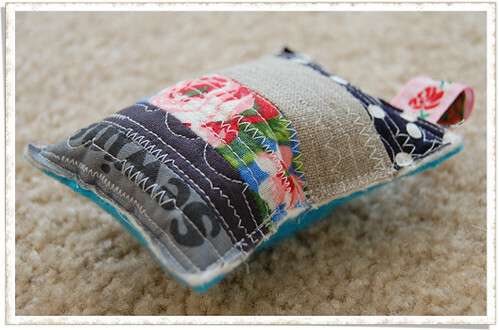 love your pincushions, great way to use up scraps of fabric. 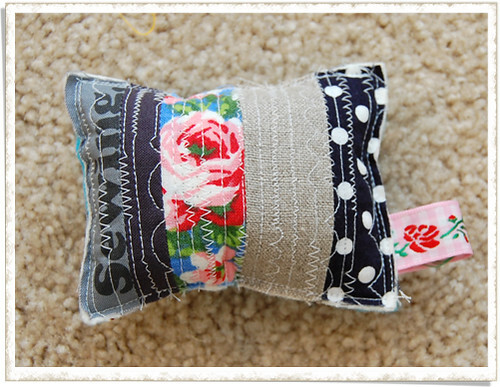 Love the pin cushions! Each one is so unique and interesting to look at with the different scraps you used and the different stitching. 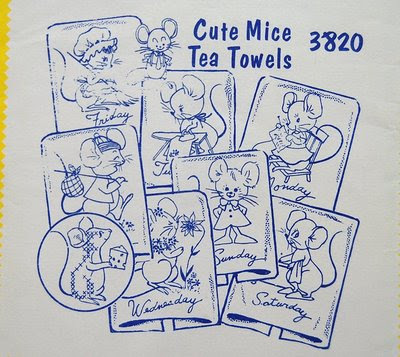 I have some of that printable fabric, but have been afraid to use it, so I will check out that HP site. Cute pincushions. LOVE all of your fabrics! 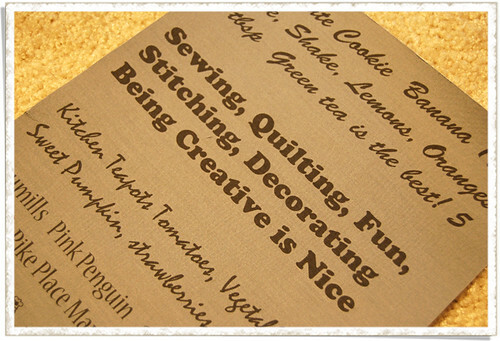 I've printed labels on fabric on my printer before but what a clever idea to print fabric to use in a project! 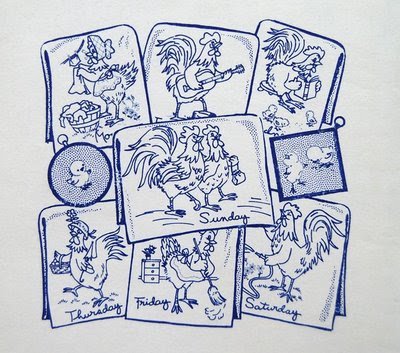 I love the embroidery patterns; especially the roosters! 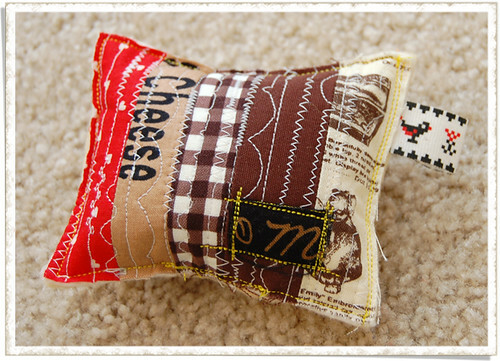 The pin cushions are adorable, too. 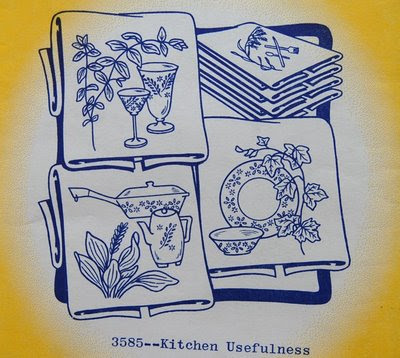 I've been wanting to print on fabric, too, but have been apprehensive. Maybe I'll jump in because yours turned out great! They are amazing!! What a find! 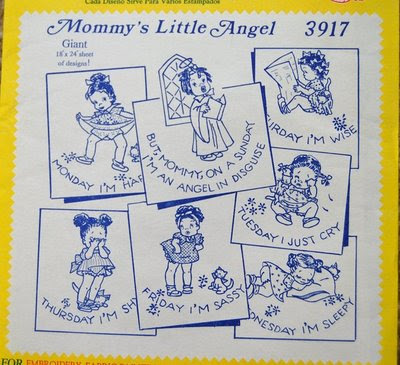 I love LIttle Miss Housekeeper and Mommy's Little Angel! 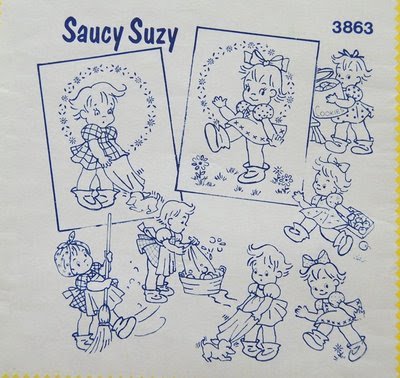 Oh I love them, and you printed your own fabric, i would love to do that, but to tell you the truth I am scared, but yours turned out so cute, I love all the patterns, especially Saucy Suzy and the Little Ducks, what a lucky find for you!!! Nice pincushions! 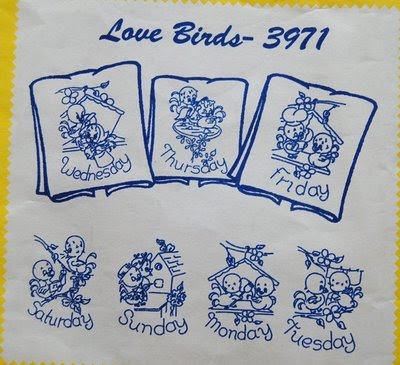 My step-daughter is going to Japan for the first time in April and I have asked her to bring me back some fabric from there. They will be visiting Tokyo, Nagoya and a few other smaller towns. 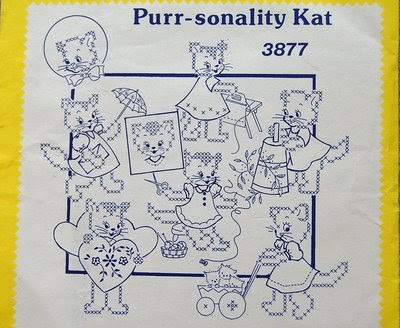 What are the names of some stores that sell Japanese fabric? I would appreciate any suggestions. How nice is it that your step-daughter is going to visit many places in Japan! If she gets to go to Nippori in Tokyo, there will be lots and lots of fabric warehouses near the JR station, but I bet she wouldn't be interested in the place - pretty boring if you don't care about fabric. The major chain fabric stores just like Joann here are Yuzawaya and Okadaya. Yuzawaya has great sales. Hope this helps! The pincushions are so cute. 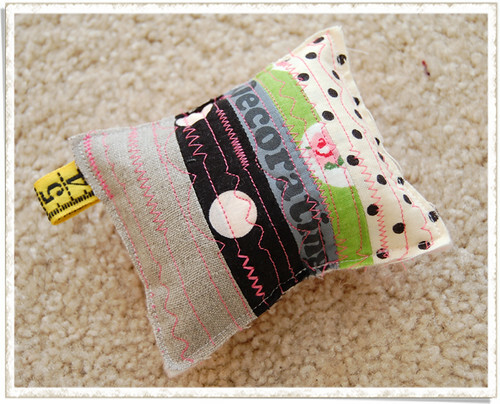 I've been thinking about making some pincushions for the longest time. There are so many cute patterns out there. 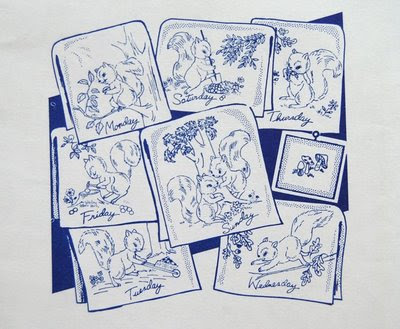 I love the iron on transfers. 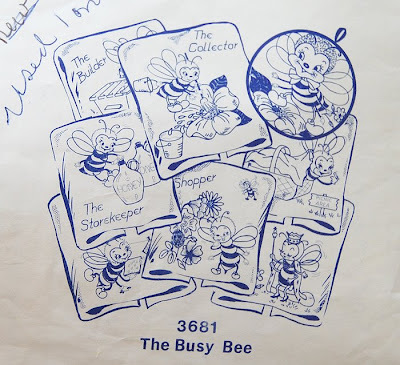 I used to embroider with those as a child. They were so much fun. 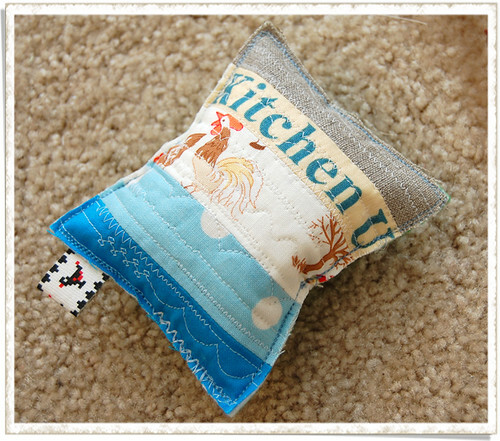 love that kitchen fabric of yours, the pincushi0ns are great. 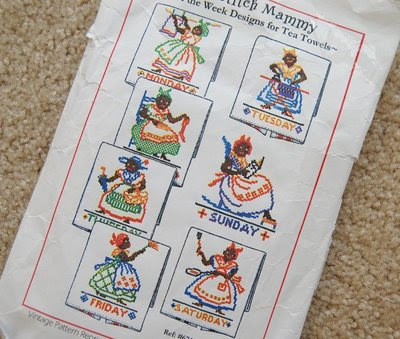 What a find on those patterns. Thanks Ayumills! I passed on the names of the stores to my step-daughter. They are so excited that they are going to Japan! 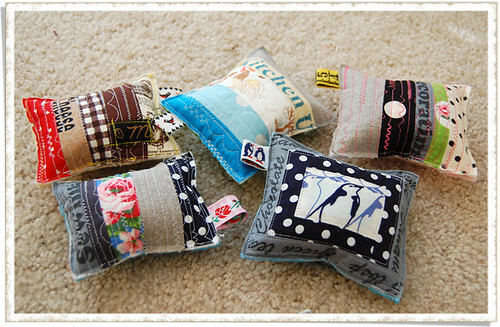 Love the pincushions...you have a terrific fabric stash! I always love seeing the fabrics you put together! I have really enjoyed reading this post. I loooove the pincushions and thanks, thanks! for the info on printing your own designs on fabric with a home printer. I really can't wait to have some time and experiment. It is so exciting! Love your blog and the things you make. Darn it! 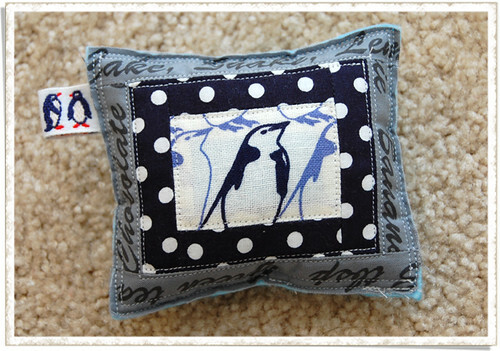 I was too late in your shop for the penguin pin cushion... How adorable! Hi, I know this is kind of late - er, just a little! 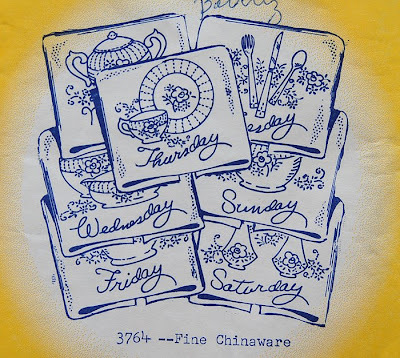 - but I found your teapot tutorial and have been plotting to make it for my Aunt who is a tea fanatic and not doing too well healthwise. 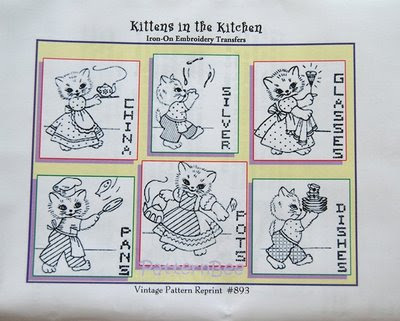 Anyway, as I came back to look at the pattern to help me figure out how/which/what fabric to buy I came across your stitchery patterns. 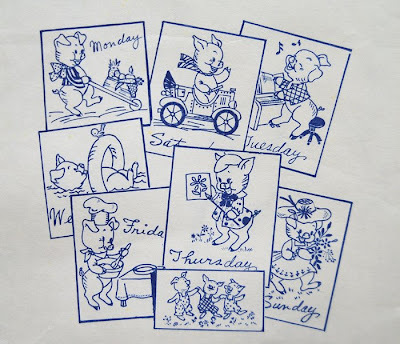 I LOVE the one with the little kittens doing the 'days of the week' chores. Are you selling them? 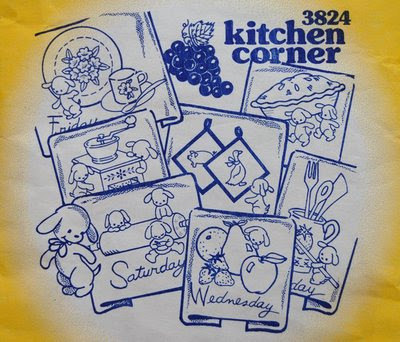 It sounded in your post like you might be convinced to part with one or two, and I have 7 lovely floursack towels hiding in my dresser waiting to become a "so old it's hip" gift for my 24 year old daughter who is just getting her first apartment. If you still have it please email me! Oooooh, and I made your fabric basket earlier this week for my mom...she LOVES it!! Thanks! I love your pincushions, they are so cute! Just ordered the book and silk screening kit. Can you tell me what kind of printer you have? Your blog is such an inspiration! You're a very gifted woman. Hi there! I used a standard Canon printer to print out the fabric, but I've found it is much better to silk-screen instead of printing directly to the fabric. 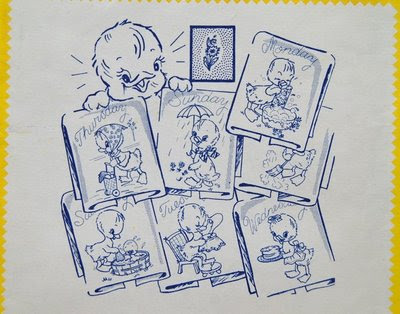 If you silk-screen your fabric, the ink is permanent and will not spear with water. Fabrics printed by a standard printer will smear with water, and colors aren't as vivid.